The Church of France was ravaged by the heresy of the Albigenses who, not satisfied with teaching false doctrine, pillaged the churches and massacred the priests. In 1215, Innocent III saw in a dream the tottering walls of St. John Lateran, held up by the powerful shoulders of a friar. 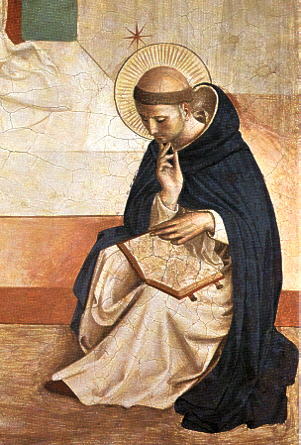 This friar was St. Dominic whose preaching defended Catholic doctrine against the new heresies (Epistle). Before his birth, his mother had in a vision her child in the shape of a little dog holding in its mouth a torch which was to set the world on fire. Called Dominic, because his parents attributed his birth to the prayers of the holy Benedictine abbot Dominic of Silos, he truly belonged to the Lord, as his name suggests. Born in Spain, of the noble family Gusman, he distinguished himself by his purity as is signified by the lily he holds (Alleluia) and his white habit. Having witnessed the many evils caused by the heretics in the south of France, he founded to oppose them the Order of the Friars Preachers (Communion), whom he armed with the shield of truth to teach doctrine and the sword of the word to preach it. The Dominicans number many saints of both sexes who, like their founder, ardently studied the Word of God in the Gospel, which as St. Dominic says is the book of truth and “the book of charity”. This saint loved our Lady in a special manner and preached the devotion to the Rosary. He died on August 6, 1221. INTROIT Psalm 36:30 – 31. O God, Who graciously enlightened Your Church by the good works and teaching of St. Dominic, Your Confessor, grant by his intercession, that she may never be deprived of temporal helps and may ever advance in spiritual growth. Through Jesus Christ, thy Son our Lord, Who liveth and reigneth with thee, in the unity of the Holy Ghost, ever one God, world without end. R. Amen. Lesson from the secons letter of St Paul the Apostle to Timotheus: Beloved: I charge you, in the sight of God and Christ Jesus, Who will judge the living and the dead by His coming and by His kingdom, preach the word, be urgent in season, out of season; reprove, entreat, rebuke with all patience and teaching. For there will come a time when they will not endure the sound doctrine; but having itching ears, will heap up to themselves teachers according to their own lusts, and they will turn away their hearing from the truth and turn aside rather to fables. But be watchful in all things, bear with tribulation patiently, work as a preacher of the Gospel, fulfill your ministry. As for me, I am already being poured out in sacrifice, and the time of my deliverance is at hand. I have fought the good fight, I have finished the course, I have kept the faith. For the rest, there is laid up for me a crown of justice, which the Lord, the just Judge, will give to me in that day; yet not to me only, but also to those who love His coming. GRADUAL/ALLELUIA Psalm 91:13 – 14. The just man shall flourish like the palm tree, like a cedar of Lebanon shall he grow in the house of the Lord. Ps 91:3 V. To proclaim Your kindness at dawn and Your faithfulness throughout the night. Alleluia, alleluia. Osee 14:6 V. The just shall blossom like the lily; and flourish forever before the Lord. Alleluia. GOSPEL Luke 12:35 – 40. At that time, Jesus said to His disciples, Let your loins be girt about and your lamps burning, and you yourselves like men waiting for their master’s return from the wedding; so that when he comes and knocks, they may straightway open to him. Blessed are those servants whom the master, on his return, shall find watching. Amen I say to you, he will gird himself, and will make them recline at table, and will come and serve them. And if he comes in the second watch, and if in the third, and finds them so, blessed are those servants! But of this be assured, that if the householder had known at what hour the thief was coming, he would certainly have watched, and not have let his house be broken into. You also must be ready, because at an hour that you do not expect, the Son of Man is coming. My faithfulness and My kindness shall be with him, and through My name shall his horn be exalted. Sanctify, O Lord, the gifts dedicated to You, that by the merits of St. Dominic, Your Confessor, they may obtain a healing remedy for us. Through Jesus Christ, thy Son our Lord, Who liveth and reigneth with thee, in the unity of the Holy Ghost, ever one God, world without end. R. Amen. Grant, we beseech You, almighty God, that we who are heavy laden by the weight of our sins may be sustained by the spiritual help of St. Dominic, Your Confessor. Through Jesus Christ, thy Son our Lord, Who liveth and reigneth with thee, in the unity of the Holy Ghost, ever one God, world without end. R. Amen.